We’d eyed the crumbling windmills that watch over the harbour and the Aegean on previous stops in Bodrum and kept saying we’d make it up there one day. Although decaying, they stand stout – a neat row along the crest of the hill. The views must be fantastic, we thought. Over the other side, the resort of Gümbet might beckon us. Well, it was April. Gümbet summer party life would be yet to kick in. We could sneak down and see what Gümbet was all about; quietly. 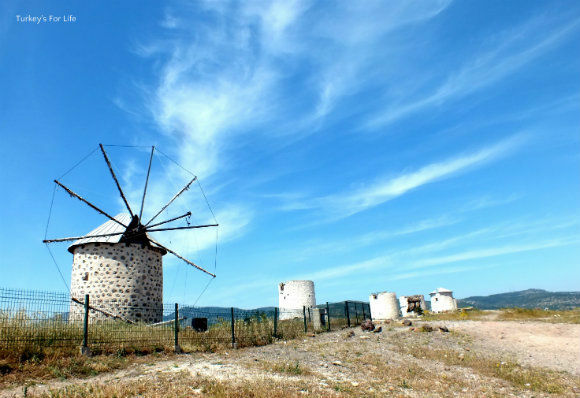 And so we set off on a Bodrum Gümbet walk – via those windmills. Springtime travelling in Turkey means it’s often ideal walking weather. This day was one of those clues that summer was en route! It was on a bit of a charge, in fact. As we set off, out of the town centre and uphill, that realisation kicked in that neither of us had even considered buying suncream! It was hot! Thankfully, Barry was using the GPS on his phone. We were thankful because the little arrow marker soon indicated to us that we were going the wrong way. We needed to be heading up the steep hill we’d just been grateful for turning away from! As Barry marched on, effortlessly, I took the opportunity for the odd breather, admiring the dwellings along the roadside. Ahh, that idyllic colour scheme of whitewashed stonework contrasting against blue woodwork, wrought iron and other exterior accessories. Yes, you know you’re on the Aegean! Now, lest you go thinking we’re climbing a mountain or something, here, we’re not! It’s just that the walk to Gümbet and the windmills means you follow roads that climb along the hilly coastline. It’s a good leg stretch. Nothing too taxing. It’s just that our winter-primed bodies weren’t quite ready for the heat that greeted us. Not to worry, though. Barry had planned a route that meant we avoided main roads. Any little vistas – like the one above – they were my photo stops. 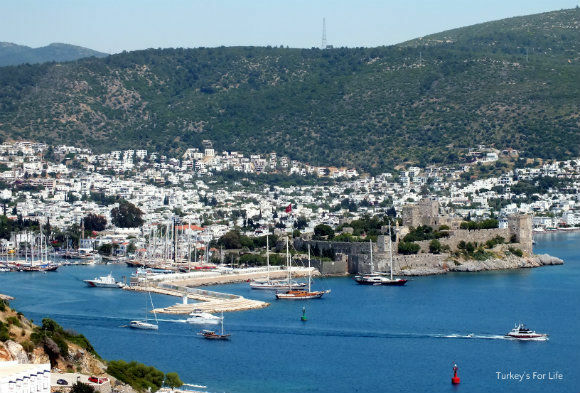 Time for a breather and time to take in the scenery of the Bodrum Peninsula. We were in no rush to get to Gümbet. Just happy to amble. After losing sight of them, wandering through the suburbs, our first port of call – the windmills – eventually came into view. More uphill climbing but the road didn’t look too foreboding. And hopefully, the views would be worth it. More photo opportunity stops for me, anyway. As we climbed further up the hill, towards the summit and the windmills, the views over Bodrum and out towards the İçmeler boat yard started to reveal themselves. Colourful spring flowers dotted the scrub and meadow. Spring wildflowers are such a feature of our travels in Turkey. The Perge stadium in Antalya was blanketed with them. Our memories of Myra are as much about the spring blossom as the ruins themselves. And our road trips in East Turkey – wow, the sea of poppies as we left Iğdır and the Ahlat tombstones rising tall from the delicate new growth. Yes, this walk to Gümbet, via the windmills, was definitely proving to be worth it for the views. We all love a view of the amazing Bodrum Castle and this scene slowly reveals itself to you as you climb closer towards the windmills. A good zoom on the camera, of course. These views are quite distant. Aegean boating life going on down below us. Cows grazing on the grasses and wildflowers just over the other side of wall, next to us. At the final approach to the windmills, after many photo stops a guy popped up from nowhere. Tea, coffee, water, orange juice. There he was with his little makeshift cafe. How ‘official’ this cafe is, who knows. He had some grateful thirsty customers, anyway. Although the decay is sad, there’s also a lonely beauty about the place. Aside from the cafe customers who were now out of sight, there was only one other guy up here. Our feet crunched over thousands of pieces of broken glass – remnants of broken beer bottles that have been trampled into the ground over many years. Some pieces have been here so long, they’ve smoothed and now more resemble gem stones than litter! To the east is Bodrum. South of the windmills, the views of the coastline offer us a glimpse of what the peninsula looked like before legoland-style villas, apartments and hotels began to spring up at breakneck speed. Wonder how long this scene will remain untouched. Further ahead, across those Aegean waters is Kos, Greece. Ahh, what a lovely day we had on that island – another wander around on foot, as you might expect. But let’s take our gaze westwards to Gümbet. What did we know about this resort before we’d even seen this view from the windmills? Summer party town. The Gümbet nightlife reputation preceded all, for us. 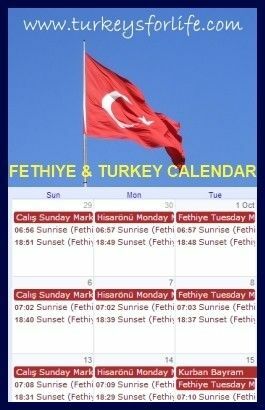 When friends from the UK said they were booking holidays to Bodrum, what they actually meant was, they were booking holidays to Gümbet. They were off for a clubbing holiday in a clubber’s resort. And so, as we stood with our backs to the windmills, looking down over this sheltered, horseshoe bay, rimmed by a stretch of sandy beach; well, we were a bit taken aback, to be honest. Gümbet was indeed beckoning. We wanted a closer look! Well, we’d done all the climbing now. An easy walk back along the road and a left down hill to Gümbet rather than a right. As we approached, the place was deserted. This is a summer place. As we passed through Gümbet bar street, all the businesses we expected to see were indeed there. But they were yet to open for the season. Suited us perfectly. We pressed on to Gümbet Beach. Just look at this beach! Did we ever think we would use the words ‘Gümbet’ and ‘serene’ in the same sentence? Couples on the sand, enjoying the peace and tranquility of this beautiful bay. We were enjoying the peace and tranquility, too. Guess the problem is, once places become famous as a party holiday resort, those of us who aren’t really into that type of thing tend to dismiss them. But many is the time that places like Gümbet became so popular because they were so idyllic. Apparently, not too many moons ago, Gümbet was a bohemian paradise. A place to pitch your tent and while away the days in splendid, chilled out isolation. Not unlike Ölüdeniz was at one time. At the risk of sounding like, “We remember when all this was fields,” we have clear recollections of pitched tents along what is now the main road to Belcekiz Beach in Ölüdeniz. There are no doubt many Gümbet dwellers who could say the same. And it’s not just the benefit of a sandy beach, but of a soft, crystal clear rippling sea, too. Of course, just behind us, are the rows of Gümbet hotels and bars. 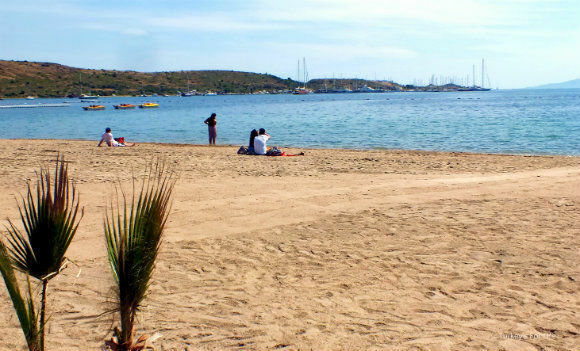 In summer season, parts of Gümbet Beach become private areas that are used by particular hotels. While we were there, parasols were being sprayed in various colours and staked into the sand. That wasn’t our concern, though. The fact that you feel almost as though you have discovered a secret bay – that’s Gümbet out of season for you – is a bit of a head mash. 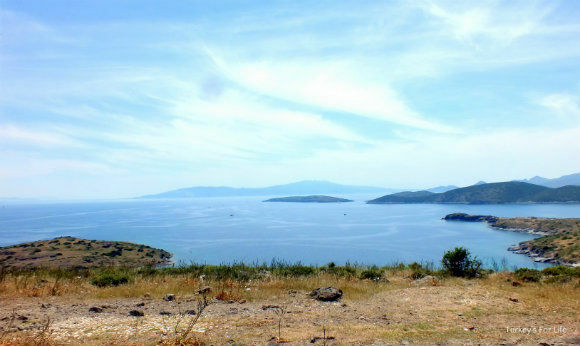 Private yachts and gülets anchored along the headland. Motorboats, fishing boats and dinghies putting along in their own leisurely time. A couple of people braving a swim in the sea. Well, we did say it was a hot day, remember. 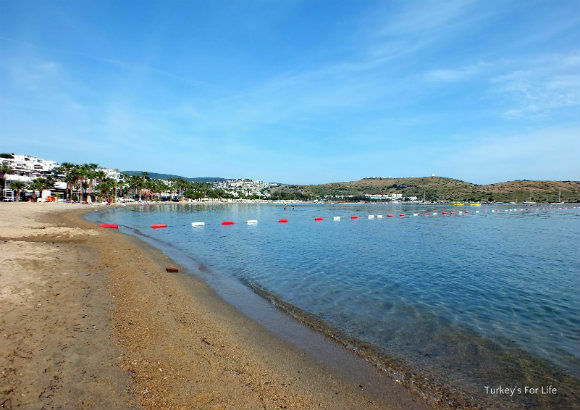 We stood on Gümbet Beach and looked back towards the windmills on the hill in the distance. Heat and a hill climb deserved a beer. One bar had just opened that day. Never fear. Wherever you are in Turkey, someone will always do their best to accommodate you. The waiter took off on his scooter and returned a couple of minutes later with two icy cold beers from the shop! Bliss. Hot spring day, a cold beer, secluded bay. Two English girls arrived and sat themselves down – and we lost the attention of our waiter. Guess the season was starting. Mild amusement as we took our leave from Gümbet and jumped on the dolmuş back to Bodrum centre. The walk from Bodrum to Gümbet takes 40-45 minutes. If you want to take in the windmills, too, give yourself another 45 mins to an hour, just to enjoy the scenery, too, once you’re up there. There’s no entrance fee to the windmills and there’s a small cafe serving refreshments at the top. Take a drink with you though as we’re not sure if the cafe is a permanent fixture. There’s a regular dolmuş service running between Bodrum and Gümbet throughout the year. 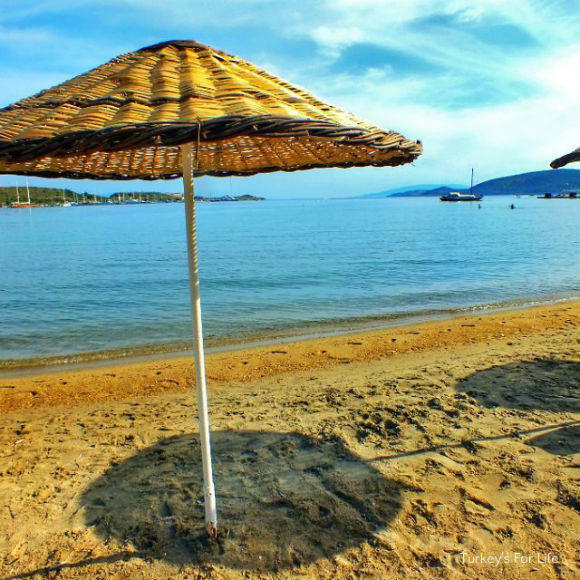 You can book hotels in Bodrum and Gümbet through Booking.com. If there was such a thing as the Gumbet Tourism Board, they are in your debt. Lovely post. Gumbet can be a bit trashy but we’ve had some memorable days and nights in Bodrum’s pushy little sister!